Date: 22 August 2015. Appearances Can Deceive. 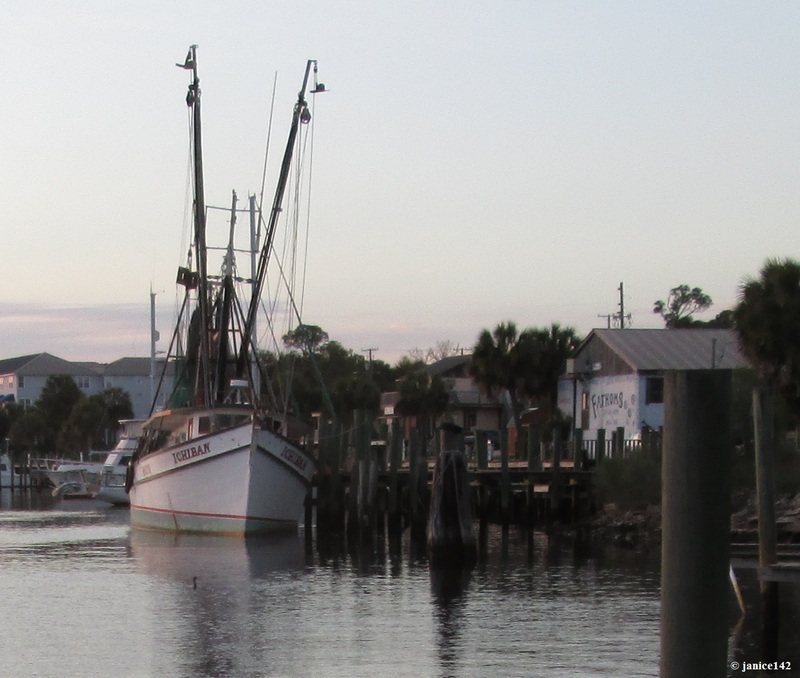 A few months back I met a couple who were viewing a shrimp boat docked near me. The boat was listed to the port side and the gent wondered if it was sinking. A couple of disparaging remarks were made about the condition of the boat too. Not everyone knows a working boat will not be spiffy and shiny like a yacht. These boats are tools to earn a living for a family. They do tend to be a bit rough around the edges. Though perhaps not Yacht-like in appearance, the engine and gear on a fishing boat are reliable. 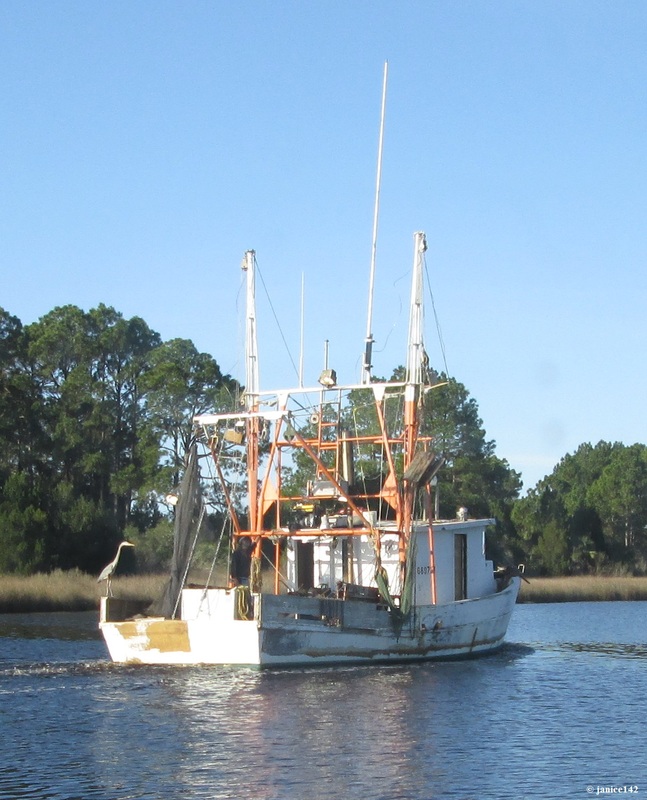 The shrimp boat captains are at sea miles from land frequently. Because lives and livelihoods rely on a safe arrival back at the dock, the boats are usually well-maintained by their owner-operators. From the looks of things I'd be willing to say the captain opted to fill his port side tanks first. Later in the day the fuel will be pumped into other tanks to even the boat out. It's the way the fishermen do things. Keeping the boat on an even keel (level) is the goal. With water (to make ice) and fuel, well, lots of shifting takes place. If you see a boat that appears out of kilter, ask. Most of the time it's nothing at all to worry about. This working boat has a blue heron hitchhiker. I'll bet there's fish aboard too! As for me, I'm working at the galley re-do. That's an upcoming article. Of course things turned out to be a bit more complicated than originally planned. It's a boat. That happens. First though, we have to arrive safely in St. Pete. I'll tell you how I managed that and introduce you to some of the folks who helped make it all possible. Until next time, happy boating. Does adding fuel affect the ballast of your boat? How many fuel tanks do you have? Seaweed has two, outbound amidships. Aphorism Alert: Your present circumstances don't determine where you can go; they merely determine where you start. Nido Qubein.